Sometimes you read a book because you discover it. Sometimes your read a book because one of your best friends from high school discovers it and flat out mails you a copy of it instead of telling you about it. Console Wars for me was the latter. Apparently, my friend felt this book was so far into my wheelhouse that he didn’t even ask me first. He just sent it to me. He was right, of course. That being said, I’ve only ever reviewed one non-fiction book before now, predominantly because I find non-fiction to be dryer and less exciting than fiction and a lot of what I try to do here on this blog is find books I think (or have seen in the cases of my own kids or friends’ kids) will grab kids’ attention. 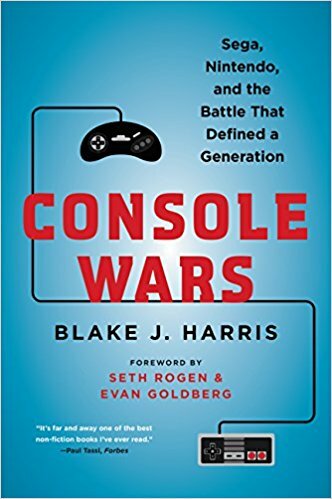 Console Wars is a non-fiction that I think can grab the attention of a teen gamer, especially one who is into gaming history and what would be called retro gaming at this point. Harris writes the story more like a biopic than a biography (as in, he has put it into a story format in an attempt to make it more interesting than a simple listing of dates, people, and events). 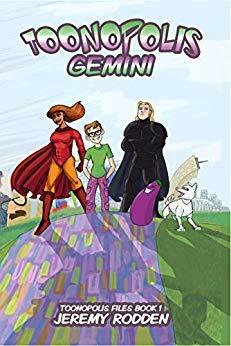 It isn’t surprising that this book has been opted for film (to be helmed by Seth Rogen & Evan Goldberg, which bodes well for anyone who’s seen their adaptation of the Preacher graphic novels [not kids, hopefully]). All in all, Harris does a good job of treating these very real humans as characters. His protagonist being Tom Kalinske, a marketing master known for his work with Mattel before being pursued by Sega to helm their David vs. Goliath fight in the late 80s/early 90s against Nintendo. A compelling story is woven with updates on some of Kalinske’s most trusted companions along the way. Ultimately, it’s an awesome “rise and fall” story that shows how a little guy can make a huge difference, beat up the bigger guy, and only the hubris/inflexibility of Sega of Japan put a spoke into the wheels of Sega of America’s bike in the end. I loved this book and would recommend it to anyone interested in the epic Sega vs. Nintendo battle of the 90s. It’s a biography about marketing people at a video game company in the 90s. If that line alone doesn’t lead you to know that this is content-appropriate for all ages, I don’t know what to tell you. Even the history of the gaming industry’s descent into the ESRB (the video game ratings system) due to a brand new little game known as Mortal Kombat even shows how prudish the industry was back then. It took Congress getting involved for the industry to even develop its ESRB system (to avoid even more political input). From the complexity of the content, I’d still rate it for mid to late teens. This deep of a biography that spends a lot of time discussing marketing concepts and sales figures is unlikely to hold the attention of anyone younger, unless they’re a big retro gaming geek and really want the history here.